Here’s a list of iOS 8.4 compatible jailbreak tweaks and apps available on Cydia. The list is updated regularly, so check back for updates from time to time. As expected, although probably a little quicker than most would have anticipated, the TaiG team pushed out a new version of its tool to provide an untethered jailbreak on iOS 8.4 almost immediately after Apple flipped the switch to release the firmware. The jailbreak not only removes the limitations of Apple’s walled garden in iOS 8.4 but like v2.1.3 before it also integrates Cydia 1.1.18 and updated UIKiT Tools among other bug fixes, making it a formidable jailbreak solution. But if you’re planning on going through the jailbreak process, or have already been through it, just what tweaks and extensions are already compatible with iOS 8.4? Thankfully, there’s a list for that. Thanks to the crowdsourcing power of the jailbreak community, we now have a list of tweaks that are, and are not, compatible with the latest iOS 8.4 jailbreak. The tweaks that are fully compatible with iOS 8.4 are highlighted in green, while the ones that aren’t are flagged in red. Partial or slightly broken compatibility is marked in yellow. We recommend that you do not install the tweaks flagged in red or yellow, as it can cause your device, in some cases, to go into a dreaded boot loop. You’ve been warned. Given the fact that jailbreak is still fairly new, surprisingly many of our favorite tweaks and packages are already compatible with iOS 8.4. Packages such as Ryan Petrich’s Activator, which is used consistently with a number of additional tweaks, currently offers iOS 8.4 support through v1.9.4 which is available directly from the developer’s personal repository in a beta format. Another popular package, Auxo Legacy Edition by A3Tweaks, is showing as offering full iOS 8.4 compatibility and is available via the default Cydia repository. In addition to these, another popular tweak Springtomize 3 for iOS 8.4 has also been released. 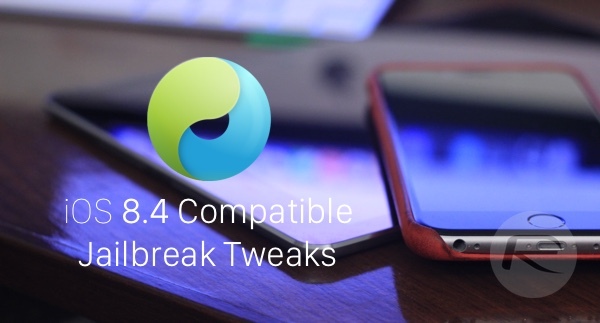 This list of iOS 8.4 jailbreak tweaks is being constantly updated by the community. Check back here for updates. Springtomize 3’s Icon Resizer option doesn’t work on iOS 8.4. Auxo legacy edition is not compatible on your version of iOS. How to fix that. messages customizer keeps my message app from opening. Allot of the tweaks on Big Boss still aren’t compatible as of this writing. It says Activator is ready but actually, it’s not. open notifier beta does not work. Facebook++ I found does not work, but browser changer does, and that is a good thing. Ok, so I have tried two apps that say yes, but they they should be on the no list, and they are Facebook++ and Message Customizer. On the “no” list is Browser Changer, and it works perfectly. I believe the only way we are going to establish a list of what works and what doesn’t is for all of us to post our experiences, as I just did . By the way, I have a iPhone 6+ on version 8.4. Anyone know of any SMS apps that do work? I have tried BiteSMS. Handcent, Messages+, iReal, and had no success with any of these. I tried it also, and that doesn’t work for me either. I noticed ** Icon Tool ** is 8.4 compatible & is an awesome tweak! I usually enjoy renaming my icons but didn’t see it on the list & noticed Icon Tool lets you do the same thing but has many more options besides icon renaming such as backup, restore date, clear caches, clear badge & a few more. It’s under many of the repos but I downloaded mine from HYI. I did just used some fraud site for unlｏcking my iphones they were pretty slow, even among the iphone was locked right back after 2 days. Somebody please validate this for me that ATTIPHONEUNLｏCKING. [cｏm] is really that good? I seen they are fast and professional.